As I was walking home the other day, I saw a poster on the side of a bus stop that caught my eye. It was an advert for a new music catalogue service from the BBC, called ‘Playlister’. But it was the text itself that grabbed my attention. 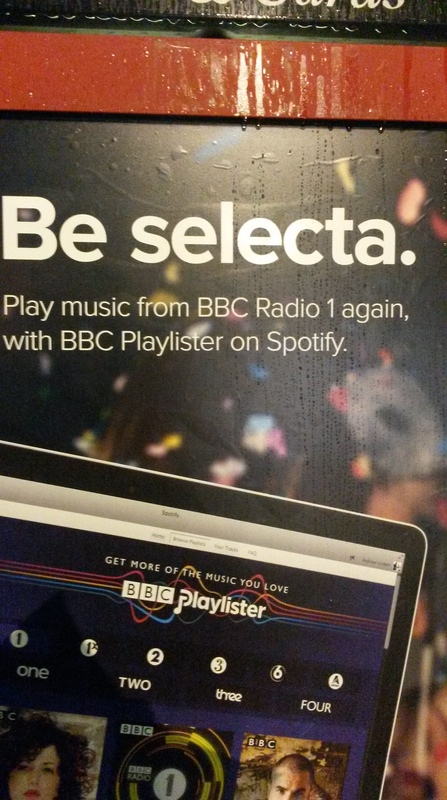 The tagline, ‘be selecta’, is a neat, if obvious, creative linguistic variation on the phrase ‘bo selecta!’. To anyone who doesn’t know the phrase it plays on, the lack of article between verb and noun will still be suitably evocative, accurately or otherwise, of some kind of pidgin or creole relative of English. And its core meaning will still be transparently – in this context at least – ‘you be the DJ!’. However, to anyone that has had at least one eye on popular culture in the UK throughout the nineties and the noughties will spot the reference immediately. The track marked a crossing of the music genre (known simply as ‘garage’) to the mainstream. At the same time, it also brought to the ears of the masses the Jamaican patois infused, urban dialect of English, representative of the predominantly black community in London that UK garage sprang from. Importantly, to white, middle-class ears the words ‘bo’ and ‘selecta’ had a mystery to them – and an obvious sense of ‘cool’. They weren’t the kind of words you would forget. The thorough lampooning quickly dismantled any sense of cool that ‘bo selecta!’ (and Craig David) had, at least among middle-class British audiences. That, I guess, was the point. Now, more than ten years later, the BBC are using the phrase – or at least a clever spin on it – to advertise their new music app. But, walking home, I realised I still didn’t know what ‘bo selecta’ means. So I looked it up. I found the answer in Simon Reynolds’ 1998 book: ‘Energy Flash: a Journey through Rave Music and Dance Culture’. In the UK garage club scene, which had its roots in the reggae dancehall culture of the Caribbean, the MC (as in ‘master of ceremonies’) was an important figure who effectively mediated between the crowd and the DJ (the ‘selecta’). If the crowd liked a tune they would cry ‘bo!’ at which point the MC would ask the DJ to ‘rewind’ the tune – that is, play it again. The track conjures up the ritual cleverly, from the narrative in the verses, right down to the electronically stuttered (‘re-rewind’) refrain. As for ‘bo’ itself, it turns out it’s not the same word as ‘beau’ as some sources on the internet suggest, although in this context it does imply approval of the selecta’s selection. Instead, it’s onomatopoeia: somewhat like ‘boom’, it echoes the celebratory sound of gun fire. And that’s it. However, there’s one interesting side-note to all this. While I was researching this blog, I found this internet discussion forum about whether non-Jamaican DJs should ever speak in patois at gigs. Should a Swedish DJ, for example, ever shout ‘bo!’ to the writhing crowd? Or, in the terminology of linguist Ben Rampton (1995), should anyone ever ‘cross-over’ to assume someone else’s identity, except perhaps in jest? As well as enjoying a taste of his patois, I found Fyah’s comments heart-warmingly balanced (especially since they are framed around proper linguistic notions of ‘creole’ and ‘standard English’). Anyone that advocates code-switching to get the party started is OK with me! But that, of course, is a whole different story. Rampton, B. (1995) Language crossing and the problematisation of ethnicity and socialisation. Pragmatics, 5, 485-513. This entry was posted in Uncategorized and tagged advertising, creativity, language, linguistics, music, words. Bookmark the permalink.